Assembled Dimensions: 7'3" Front Stabilizer to Rear Stabilizer. 8'4" from Fan to Rail. 20" wide. Shipping Dimensions: 58" x 26" x 15"
Have the comfort and ease of getting into and out of a machine that's "dining chair height." The 20" seat height makes it simple to sit in and sit out after a long workout, if your knees don't bend like they once did, or from a wheelchair. 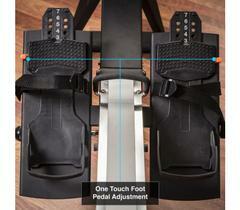 Xebex Rowers fold in half taking up less than 50% of original footprint! Only 3' long x 20" wide footprint when folded. Folding and transporting takes less than 5 seconds: pull the Xebex Rower Pull Pin until the rail touches the ground. Lift the rail upwards until it clicks into position (no tools required) - and that's it! 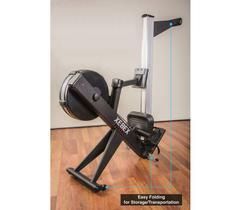 Now that it's folded, you're able to roll the Xebex Rower on 4 wheels out of the way and into storage with just 1 hand. You are in control of your output and resistance at all times. The amount of work you do is directly calculated by how hard you row. Row harder to go faster, row easier to go slower. The spiral damper allows you to quickly adjust the airflow to the flywheel from little drag at Setting 1, to max drag at Setting 10. This is much like rowing with little drag or shallow paddle depth at 1, to max drag with deep paddle depth at 10. You can change the feel of the stroke to suit your preference. 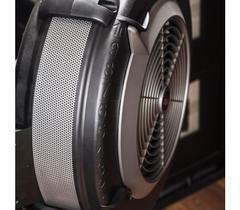 The flywheel design produces a smooth feel and minimizes noise. 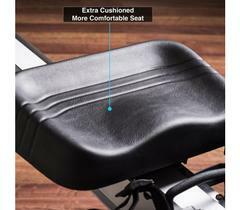 Xebex Rower seats feature extra-padded, high-density foam ergonomically designed for maximum comfort while rowing. 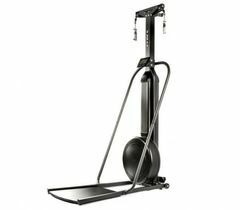 Our uniquely designed fan to utilize air resistance allows the user to enjoy a smoother, more comfortable rowing experience that maintains momentum immediately from your initial pull. Enjoy a smooth, momentum-building pull with every stroke. Xebex Rowers are known for their durability and construction. Our nearly 100 LB base provides a stable foundation for nearly any user weight. We use metal and steel where others don't. Our stainless steel chain is designed to last with minimal maintenance required. 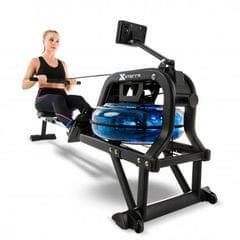 The Xebex Rower comes with a Large Console Display that's easy-to-use and gets straight to the point. Press 'start' on the Xebex Rower Console to activate. 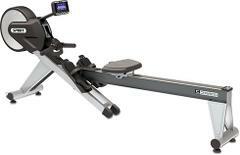 The Rower Console waits for you to begin rowing before it starts to track 7 different key measurements while you row. This means that you will begin to see work output as soon as the first pull starts. Once rowing begins, Calories, Distance, Time, Watts, Heart Rate, Strokes per Minute, and Stroke Distance begin to track. Heart Rate reader works with any 5k Frequency chest belt. Program variation is available and can be programmed for SET or TARGET distance, calories, or time with a 500m pace option. 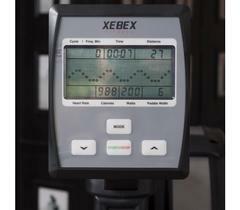 The Xebex Rower measures Calories, Distance, and Watts using a formula unique to Xebex Rowers. Xebex Rowers require minimal assembly (see video tab). We include all the necessary tools, hardware, and clear, illustrated instructions. Allow 30-45 minutes to complete the job! How does it compare to other rowers? 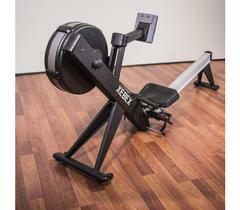 XeBeX Rowers have been tested with 1,000,000 pulls from Robotic Arms without failure. The damper settings have a larger range of resistance from 1-10, which allows users to find the perfect damper setting for them. 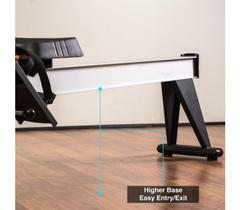 The base of the rower sits nearly 2' off the ground making it easier to get in and out. We also made the seat heavily padded so the user will be able to row more comfortably for longer periods of time.